The Higher Education Funding Council for England (HEFCE) has today announced its funding allocation for 2012-13 – a total of £5.3bn. 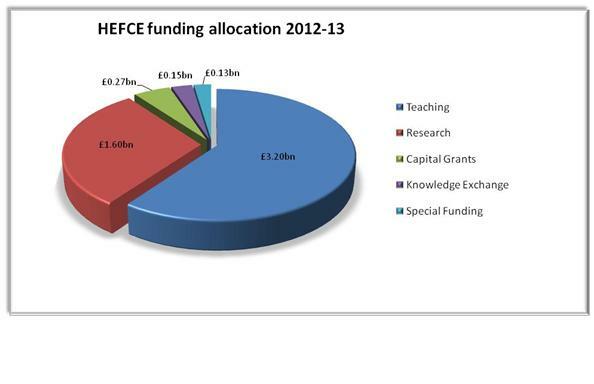 The money will be divided up into five key areas (see chart at bottom of page) with teaching getting the lion’s share (£3.2bn), followed by research (£1.6bn). In his budget speech last week, George Osborne pledged £100m towards university research centres, although it’s not clear whether this is part of the £1.6bn science fund or not. While £5.3bn is available for the academic year, £9.5bn is available for the financial year, which is an overall increase of £200m from 2011-12. Most of that extra money is likely to be put towards filling the gap between university expenditure and the income generated from tuition fees, which seems strange to me given that fees will nearly triple this coming academic year. While some scientists will take solace in hearing that funding is at least being maintained, the focus towards institutions with a strong history in scientific research will make life harder for the smaller and less-established providers of higher education. This is coupled with the cuts in capital spending that mean that vital new equipment is unavailable as departments have to cut back their expenditure on replacing old kit. For those institutions trying to conduct research without the help of HEFCE funding, the future is looking rather bleak. This is going to get a lot harder if the focus shifts towards research with the clearest commercial applications. Chief executive of HEFCE, Sir Alan Langlands, said: “HEFCE remains committed to promoting the creation, dissemination and application of knowledge, supporting successive generations of students, the wider academic community and the positive contribution that higher education makes to the economy and society. It seems to be very much the same old mantra that we’ve been hearing repeatedly from the Government: we know how important scientific research is to the economy so we are going to leave things pretty much as they are. How can this stance be the most effective route to supporting the UK’s world-renowned scientific research base and steering the country to economic recovery?